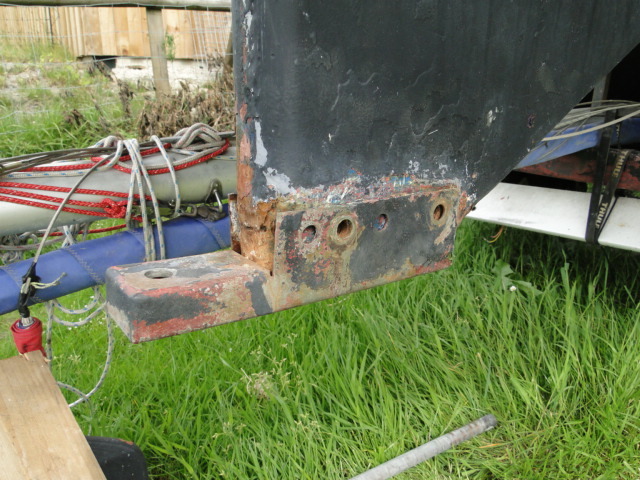 Boats fitted without a skeg have been known to lose their rudders. 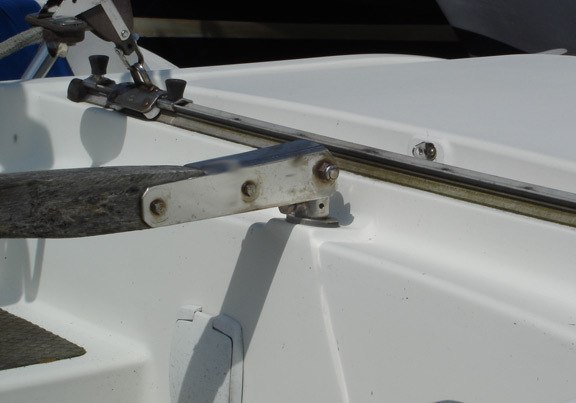 One solution is to drill a locating hole through the top of the rudder post to take a bolt – this will positively secure the rudder and prevent it dropping downwards. Another solution is to fit a skeg with a pintle and pin fitted at the lower end – see pictures below. 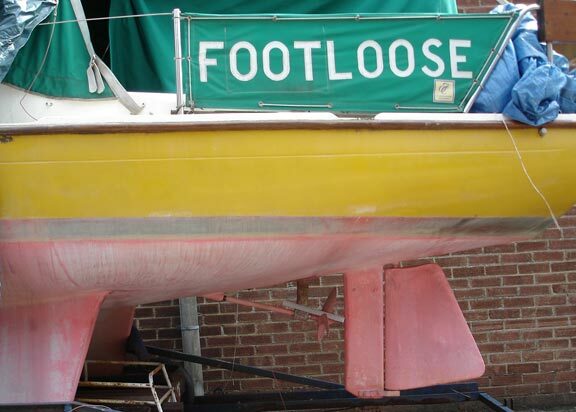 Footloose is a junk-rigged Corribee fitted with an inboard BMW engine. The skeg is obviously a different shape, to accommodate the propeller. The skeg and rudder on Clareen, a 1984 mk3 Corribee. This is a standard factory-fitted skeg shape. Note the identically shaped rudder in both pictures. Charles Riley writes: Dream on, my 1982ish Mk2 Corribee is under refit this year and I’ve been examining the stainless steel pintle assembly which was factory fitted to the skeg. Poking around with a screwdriver revealed that some moisture was weeping from the skeg where the pintle assembly is mounted, so I decided to remove the pintle assembly and see what was going on. 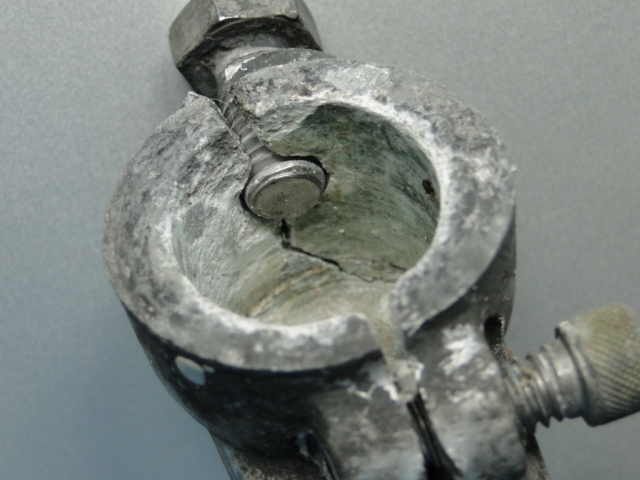 The bolts securing the pintle sheared off when I came to remove them – pitting corrosion had reduced the thread diameter within the skeg to a few millimeters and they soon came out. The pintle assembly was removed and the skeg base exposed. I am pleased that I looked, not only because I found the corroded bolts, but because the skeg base was in fact exposed hardwood which was quietly rotting away. About 25mm or so was easily removed before I got to solid hardwood inside the skeg. For some reason, the base of the skeg hadnt been glassed over, probably becasue the pintle assembly would not have fitted if it had done. The hardwood seems to extend up into the skeg for about 200mm – easy to determine this by hammer tapping. Repair was not difficult: I completely dried the skeg out (an easy job this spring!). I epoxied in some new hardwood (I had some teak spare) and then sealed the assembly with more epoxy. I replaced the pintle assembly and refitted new A4 M10 60mm set screws with loc nuts. At the same time I discovered the tiller headstock was cracked through (as per the warnings / advice on this site) so without doing these repairs I would probably have lost my rudder next season and the skeg would not have saved me as the pintle would have gone with it! The following has been kindly provided by Peter Willson, who owns Blue Moon, a Mk II bilge keel Corribee manufactured in 1978. The rudder on Blue Moon was showing a number of problems. There was osmotic blistering especially on one side of the rudder; there were rust stains at the base of the rudder; the rudder was not in alignment in two planes – the stock being bent as might have resulted from hitting an underwater obstruction while the rudder was inclined 20 degrees to starboard; there was also evidence of corrosion of the (phosphor bronze?) stock where it entered the top of the rudder; the head-stock had at some time had a through bolt fitted (good idea to prevent lost rudders) but was drilled out of alignment so the tiller was out of line with the rudder blade. I had also read of problems with tang failure so decided to open up the rudder and check it out. I had no information on how the rudder was built so used a stud detector to try and find out what was inside. This reveals a stock that goes about 50% of the way down into the rudder with just two tangs running at right angles to the stock and in the top half of the blade only. I opened the rudder by disc cutting and sawing around the edge and finally splitting the rudder with the aid of wedges, trying to preserve the G.R.P. outer shells as much as possible. This was a fairly brutal business, on account of the method of construction the rudder doesn’t just split apart like splitting slate. It shows that the rudder was constructed of the stock and tangs, encased in a G.R.P. shell, with the void being entirely filled with a dense filler of some sort. 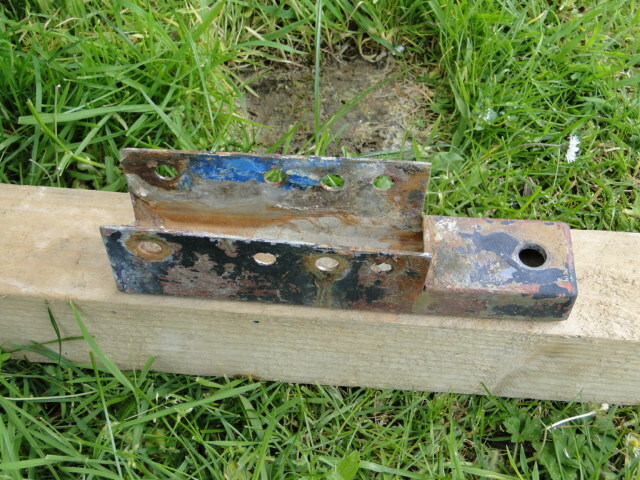 Although I could now straighten the stock the corrosion at the point where the stock entered the rudder reduced the effective 1” diameter by some 15%, a reduction in cross sectional area of some 38%, also the tangs – two pieces of ¼” mild steel round bar were very rusted and wasted away where they were joined into the stock – no wonder some have reported tang failure. I decided to replace the stock with 1” 316 grade stainless steel, to lengthen it to reach ¾ of the way down the blade and to fit three 8mm round bar tangs (an interference fit into the stock protruding slightly from the ahead side) also of 316 stainless in order to prevent any problems with galvanic corrosion caused with dissimilar metals being in contact in a saline environment. The shells were then cleaned up – a long job with the angle grinder – (most of the gelcoat and anti foul removed from the outer and all traces of filler from the inside) and the two halves re-enforced with chopped strand matt on the inside before being joined together enclosing the stock with woven roving tape. A 25mm hole was made in the one of the shells so the filler could be introduced. All was then carefully aligned before filling the void. After some research and advice from CFS resin supplies I decided to use a mixture of polyester resin mixed with talc. This was mixed resin plus 1% catalyst first to ensure thorough mixing then the talc added to an equal amount by volume. The resulting mix was added through the hole in 500mg amounts and allowed to go off before introducing the next amount. (how was this done in the factory – does anyone know?) This was all to keep the temperature from rising too high as can occur with large castings. Finally the hole was closed. It was now time to grind out the osmotic blisters some of which were very deep and smelled of the characteristic vinegar when opened. These were filled with a polyester/talc mix. The surface was then covered with G.R.P. flow coat. Sanding this off to provide a smooth surface is another long job as flow coat doesn’t self level like paint. Finally, and after advice from International Paints the surface was finished with Intercoat epoxy primer and Trilux hard anti-foul as Blue Moon is dry sailed. The head stock was refitted with a through bolt but I also added a stainless steel collar just below the head stock which has a set screw into the stock to ad an extra degree of security to guard against rudder loss (Blue Moon has no skeg). Blue Moon sails well with her renewed rudder and should now be set for another 30 years. When we first purchased Casulen II, she had lost her rudder in the Clyde, and the previous owner had made a new one for her. The only problems with this were the excessive turbulence and the fact that the rudder was at lest 5 degrees misaligned. After sailing on Windermere for one winter season, we decided that we needed to make a new rudder. Having looked at several other Corribee rudders, and listened to advice from a yacht designer, we decided that we should make a semi-balanced rudder without a skeg, but also make the rudder as strong as possible and reinforce the rudder tube. The reasoning behind this is not straightforward and there was a lot of conflicting advice. 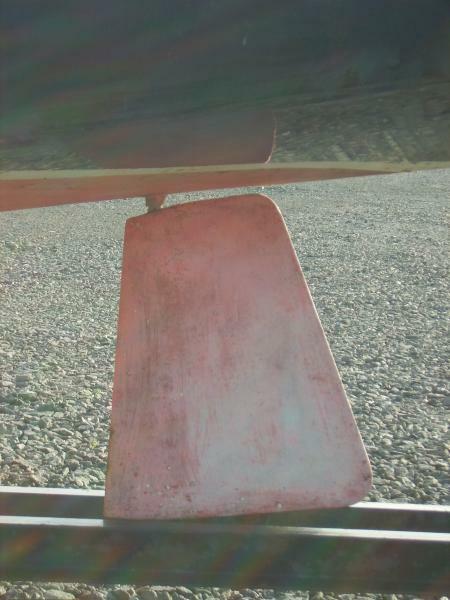 The main argument in favour of a skeg-hung rudder is that it offers protection from impacts with submerged objects or fishing lines and also in big seas when the rudder is under immense pressures. However, as Casulen II is fin-keeled, we reasoned that the rudder would be fairly well protected from lines and floating objects. Also, no modern racing yachts have skeg-hung rudders and these are taking on some of the biggest seas in the world. We decided to make the new rudder longer and narrower than most Corribee rudders, as we had been advised that this would make the helm lighter and by making it semi-balanced, far more responsive. A NACA 0012 profile was decided upon. This may sound overly complex, but is a fairly safe compromise for the average yacht, and well worth the extra effort if building from scratch. 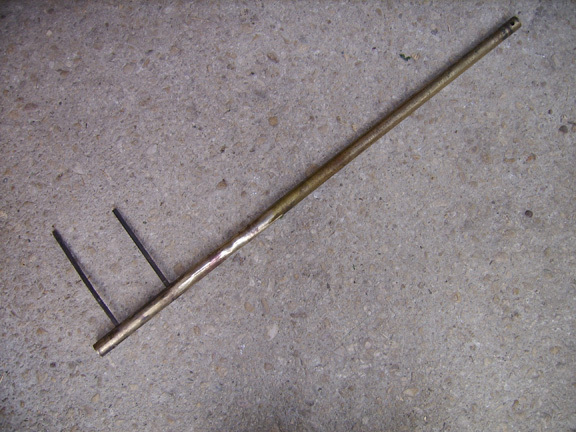 The rudder shaft was made from 1inch solid bar with three sets of tangs welded on the sides of this before being brought together and welded. All of this was 316 stainless steel. The rudder was made by laminating four pieces of ¾ inch plywood around the rudder post using thickened epoxy to stick them all together, having first routed out the shape of the tangs and rudder post. After shaping, this was coated in epoxy before being sheathed in epoxy and woven cloth to seal it. It has since received a further coat of epoxy, when we epoxied the hull, prior to applying coppercoat antifouling. As the old head fitting was cracked and suspect, we bought a new Plastimo head fitting (part no. 13383), and made a new teak tiller to fit this. One of the features of this head fitting is that it has a bolt running through the whole assembly, including the rudder post, this making it almost impossible to lose the rudder, a fate not unknown to many Corribees, ours included! This rudder has now been on the boat for 2800nm, the helm is very light but responsive and even in winds over 25kts requires little effort when helming. Reading members’ letters and various articles in the Blue Book, Magazine etc., it seems that one of the few weaknesses in the Corribee design was the method of rudder mounting. In the early design the only thing holding the rudder to the boat was the tiller headstock fitting, consisting of a pinch bolt at the rear of the headstock and a “dog” screw at the front, going into a shallow hole in the top end of the rudder stock. With a phosphor bronze stock, and a brass or aluminium tiller headstock, there is plenty of potential for wear. Later Corribees were fitted with a skeg, which supported the rudder from below. This saved it from falling off if the headstock gave way. Also some boats were fitted with a modified design of headstock, which had a bolt going transversely right through the headstock and rudder stock. This gives extra security and takes some of the load of the pinch bolt and dog screw. I had problems with the headstock last year, which resulted in losing my rudder in Poole Harbour. The problem has now been solved by having a new rudder built using two halves of rudder “mouldings” obtained from the Baltic Wharf Boatyard (formerly The Osmosis Centre) at Totnes. I use inverted commas as the “mouldings” were actually two halves of a plug for making a new mould. Norco G.R.P. 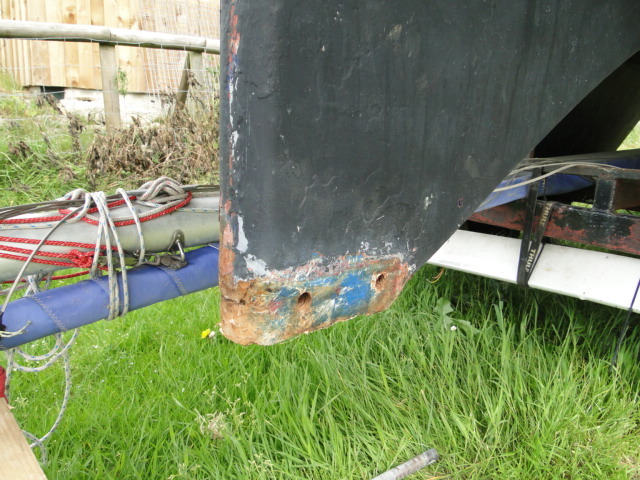 Ltd of Poole produced a new rudder by using the plug as if it were a moulding. This may seem a waste of a plug, but the alternative was to create a new female mould from the plug, then mould a new rudder from that. As the plug was in poor condition for taking moulds from, and needed considerable work to clean it up, my Insurance company would definitely not have stood the extra cost involved. The plug makes a perfectly good rudder, although it is heavier as it has much thicker GRP. Anyway, as I was creating a new rudder, I took the opportunity to extend the rudder shaft by 11/2″ upwards and incorporate a collar below the headstock fitting, secured to the shaft by an M8 through bolt. When the rudder was fitted to the boat I inserted thrust washers under the collar to spread the load on the top of the rudder tube. My other modification was to have a spigot extended from the bottom of the rudder shaft for use with a skeg – if I ever pluck up the nerve to install one! The new metalwork was all in stainless steel, being cheaper, stronger and more readily available than phosphor bronze. The final result gives me a securely mounted rudder but, as it involved losing my original rudder, I would be loath to recommend it as a course of action. My new rudder is 2″ shorter in height and 2″ longer in length than the original. This has made it slightly heavier to operate, but it doesn’t wander off course quite so readily when not being held. Derrick Thorrington’s letter in the June 1999 edition of the COA Newsletter gave a method of fitting a thrust collar which didn’t entail losing a rudder first. He suggested cutting a gap in the rudder tube in the stern locker, well above the waterline, and inserting a loose collar in there, fixed to the rudder stock with an M6 through bolt. The stern tube would need extra GRP reinforcing back to the bulkhead, each side of the gap. If I used this method on my boat, the gap would probably need to be carried into the bulkhead, as the rudder tube is fitted tight up to it. Ron Lunney has a simple method of making a new rudder blade. This involves using two pieces of 3/4″ marine quality ply, shaped to be the left and right halves of the blade, and hollowed out on the inside to take the rudder stock and cross members. Screw the two halves together round the rudder stock, using West resin as an adhesive. After this has set, fill the screw holes and heads to give a smooth surface finish, coat it with more resin and clad it with woven glass cloth, tamping well to remove all air bubbles. Overlap the cloth from the two sides at the edges, and sand smooth when set. Finish with epoxy paint. One member has met a different problem with his rudder. As it is skeg mounted it cannot fall off, but the internal cross members have given up, resulting in the rudder staying stationary when the tiller is moved. His proposed solution is to drill carefully through the rudder leading edge and the rudder stock, then insert studding or similar bars through the holes and down the internal length of the rudder blade. The holes in the leading edge will then be resealed to finish. Moonwisp’s tiller had so much play in it that at times it used to feel as if I had lost the rudder. My fix for last season was to pack the knuckle tiller pivot hole, which had become elliptical, with plastic metal. This proved to be a good fix for two weeks, but soon slowly the play returned. Having visited a number of chandlers without success, I visited the London Boat Show in search of a new 1 inch knuckle and tiller fixing. At first it appeared that all chandlers and boat yards had gone metric, but on close examination of the McNulty boat stand I was able to identify a beautiful stainless steel Knuckle and Brass tiller fixing that looked as though it came from the same mould as my Corribee’s aluminium set. I was quoted approximately £100 for the complete assembly (less laminated wood tiller) but alas it turned out to be metric – 2.5cm. Well 2.5cm is as close to an inch as one would want to get, so I got and it fitted. It only needed the length of the rudder shaft (bronze) and the bottom of the knuckle to be fine tuned with a file to allow the horizontal lock bolt (12mm) to line up with the hole in the shaft, and hence prevent the rudder falling off. The whole task was completed on one turn of the tide on the beach at Weston Super Mare. (work time with hand tools approx = 1 hour including transferring the tiller which did not require modification). PS if you want the brass look be quick! McNulty are changing it to all SS. My MK2 rudder had previously been drilled to secure. Now there is excessive play in the rudder again. May be worth considering that drilling a hole and bolting the rudder to the tiller doesn’t perminantly fix the problem. Just taking it easy in reverse may stop excessive forces being applied? I’m a proud owner of Shamrock of Halton Key. Fin keeled 1980 mk 2. Based in Brighton. Q.Q; my rudder has a little bit of play – 1 inch at the end of the 2ft tiller..
My tiller foot or stem? (don’t know the proper word) has a 14mm lock bolt all the way through the stem. Wish I could take a pic of it to show you. Does that sound like a bolt that will stop the rudder dropping off? If so any idea why have I got a bit of play in the rudder mechanism? Should I fix it. Should I be worried? I have recently acquired a Corribee named “Spindrift” which I note is in the Boat Register. 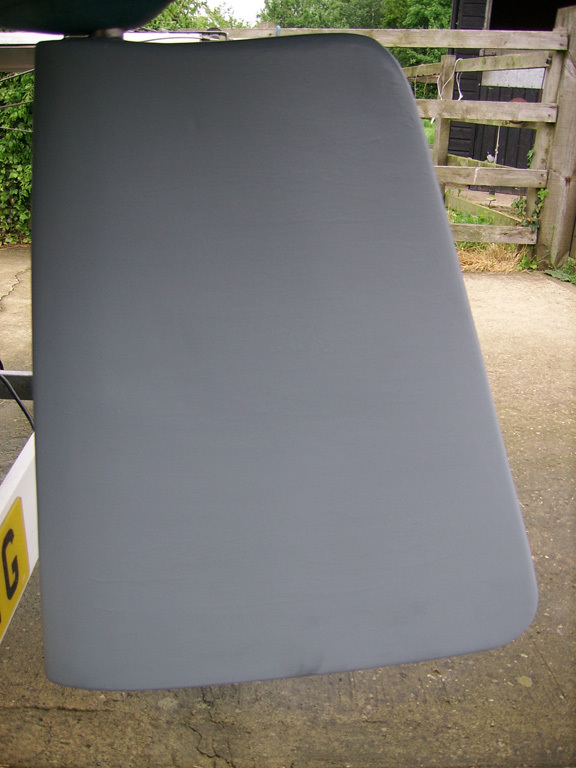 It is a fin keel that has had a skeg retro fitted. I was told by a previous owner this was because the original rudder had been lost due to the issue with the bolts on the tiller head. I saw in the “Corribee Owner Manual” on page 149 there is a story about a Spindrift owned by Frank Moore where this had happened in Poole Bay and wondered if this was the same boat? 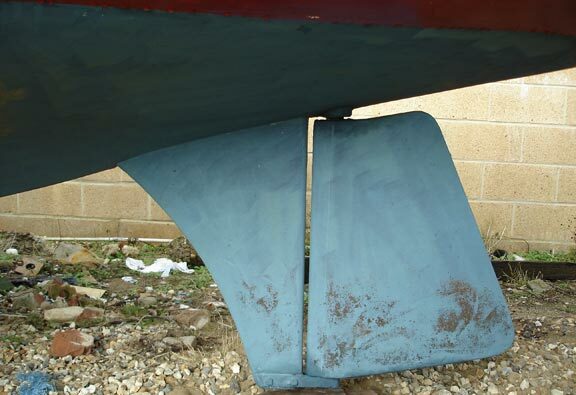 Anyway it seems that the solution adopted was to retro fit a skeg which now supports the rudder, which appears to be attached to the hull by four large external L shape brackets (2 on each side) bolted into the hull and skeg. i.e the Skeg is not actually bonded to the hull. Has anyone seen a modification like this before? I am a little concerned by the strength of this arrangement and also a risk of tearing/leaking in the hull. 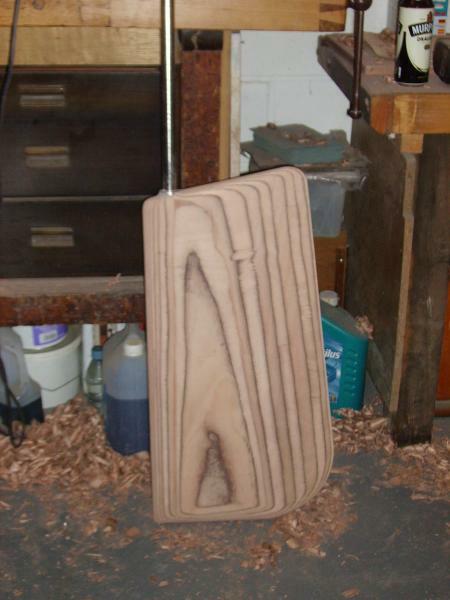 If you look in the Windrush folder you will see how I made a new skeg for my Corribee. Hi Damian. Did you resolve the skeg issue? I am thinking of retro fitting a skeg myself but do not like the sound of external brackets to secure it. I am now the owner of the Coromandel ‘Missy Moto’ that Kilda mentions in the post of Jan 2013. The rudder and skeg have been torn off as Kilda notes. 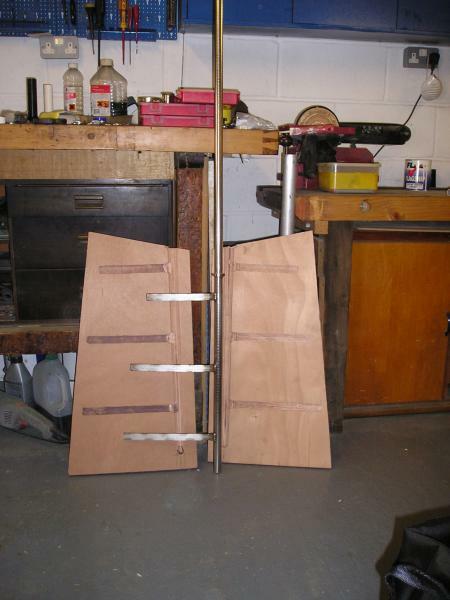 The postings of making a new rudder have been useful – along the lines of what I was thinking. Has any one any experience of making and fitting a new skeg? There appears to have been some sort of GRP tube that extended down from the hull into the skeg – as the skeg has sheared off almost flush with the hull there is very little to go as to the means of it was originally attached. Any ideas? As far as I know the skeg was moulded as part of the hull, rather than being a seperate part added on. I am sure that a new replacement skeg can be attached with epoxy and woven glass mat – maybe four layers of 450 gsm mat and some SP106 or West Systems 105 resin. Grind the existing gel coat back to give you a good 100mm of clean surface to bond to. 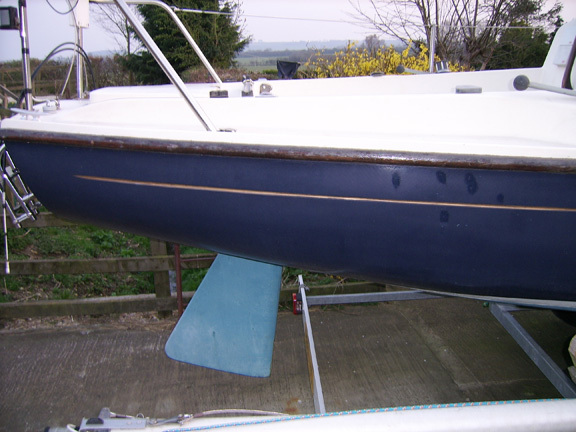 Smooth and fair the repair with an epoxy mix + colloidal silica, and prime with International Primocon before antifouling. There is a lot of good information on various repairs on the West Systems website. The grp rudder tube is just bonded to the hull and deck mouldings in the same way. It’s not clear from your post whether you also have to replace the rudder tube as well. If so, you could try using a length of windsurfer mast. You’d need to make up some bearings top and bottom – don’t be tempted to use nylon as it will swell. Use acetal (trade name ‘Delrin’), obtainable in various sizes from a number of eBay sellers. Thanks for that. 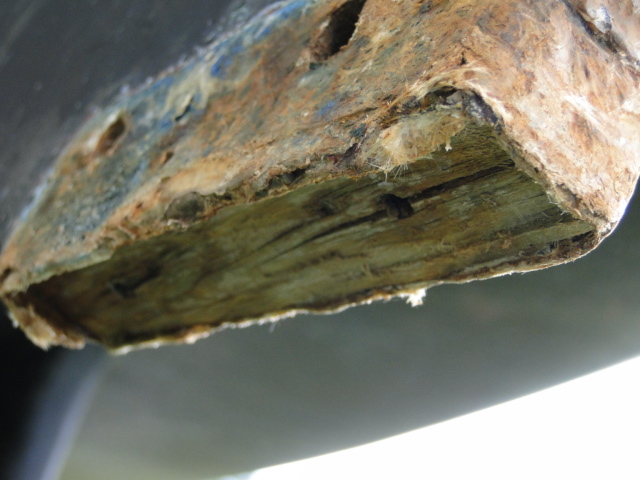 The rudder tube is mostly ok – a very small area of cracking at the bottom – easily repaired. Originally, did the rudder stock just run in this tube without bearings? To be honest, I have never had to dismantle mine, but I think it must have bearings of some sort, otherwise the shaft (bronze on my Corribee) would show signs of wear if it was rubbing on the grp. What they are made of I have no idea, so perhaps you could investigate your tube and report back. Sorry for late reply. The rudder stock tube is just GRP. Mine needs slight repair at the bottom – where it comes out of the hull – but nothing serious. I’ve ordered a new length of 316 bar for the rudder stock with the lower end reduced to fit in the skeg pintle. It will have tangs welded on as per those in this forum. When it arrives I can start making the rudder. I am also an inexperianced sailor but i have heard that Corribee and Coromandel rudders are too small and give little response in light winds. The skeg and rudder on my Coromandel have both been ripped off after breaking her mooring in a storm for the previous owner. I haven’t thought that my Corribee rudder was too small personally. Like any boat, at slow speeds the rudder is less effective, and the temptation with the Corribee is to apply more rudder – this actually slows the boat even more, to the point of stopping it, but this would be true for any boat. The other problem for an outboard powered Corribee is that the propellor isn’t in front of the rudder – if it was the rudder would be more effective. Not much you can do about that, except to allow for it when manoeuvring. If all else fails a pair of oars or a single scull could be worth thinking about. “Dream on” my 1982 ish Mk2 Corribee is under refit this year and Ive been examining the stainless steel pintle assembly which was factory fitted to the skeg. Poking around with a screwdriver revealed that some moisture was weeping from the skeg where the pintle assembly is mounted – so I decided to remove the pintle assembly and see what was going on. The bolts securing the pintle sheared off when I came to remove them – pitting corrosion had reduced the thread diameter within the skeg to a few mm and they soon came out. The pintle assembly was removed and the skeg base exposed. Im pleased I looked – not only because I found the corroded bolts – but because the skeg base was in fact exposed hardwood, which was quietly rotting away. About 25mm or so was easily removed before I got to solid hardwood inside the skeg. For some reason, the base of the skeg hadnt been glassed over – probably as the pintle assembly would not have fitted if it had done. The hardwood seems to extend up into the skeg for about 200mm – easy to determine this by hammer tapping. Repair wasnt difficult – I completely dried the skeg out (been an easy job this spring!) – I epoxied in some new hardwood (had some teak spare) and then sealed the assembly with more epoxy. I replaced the pintle assembly and refitted new A4 M10 60mm set screws with loc nuts. At the same time I discovered the tiller headstock was cracked through (as per the warnings / advice on this site)- so without doing these repairs, then probably next season I would have lost my rudder – and the skeg wouldnt have saved me as the pintle would have gone with it! Photos available if anyone wants to see what it looks like. Its worth checking. I am a relatively inexperienced sailor. I have had 2 coromandels (both with skegs) and found both very slow to respond to the tiller. I think the boats I am comparing with had very shallow long keels. Reading about traditional junk boats, I was struck by the fact they usually have a very large, long rudder which usually has some holes in it (I presume this is to make the large rudder more manageable). I was considering extending the rudder on my current coromandel in the same way by bolting on marine ply and then filling in, hoping this would make it more responsive. I would value any comments on this idea.